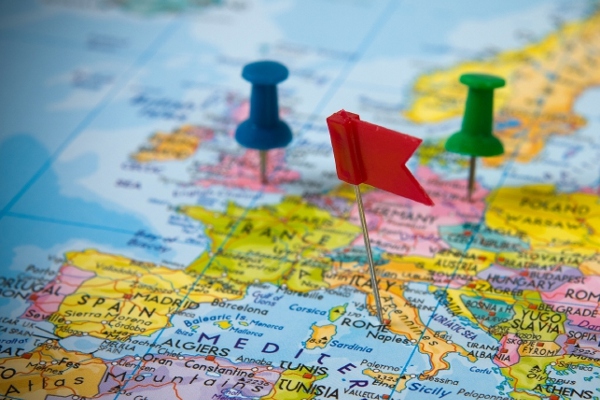 As the peak European tourist season approaches, it’s time to forget about the cliché destinations and instead follow this small but educational list to some of the continent’s best unknown travel spots. 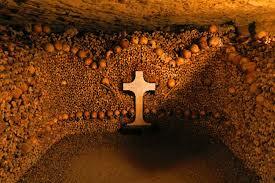 The catacombs are underground tunnels in Paris that hold the remains of over six million dead people. In the 17th century so many people had lived and died in Paris that cemeteries were becoming overcrowded and the smell of corpses was starting to linger in the city. In 1763, Louis XV banned burials, but his statement was ignored as Church’s did not agree with the concept, and the issue continued to grow until 1774 when a wall at Saint Innocents’ cemetery-quarter wall collapsed. 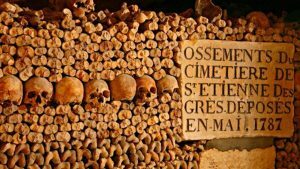 With this, the only solution to eliminate the overflowing cemeteries was to place the bones into the already existing tunnels located underneath the city created in the 13th century. From 1786, workers collected the remaining bones from the cemeteries and transferred them in the middle of the night with wagons into these tunnels where they were placed onto the walls which took them 12 years to complete. Many of the remains of these bones are skulls and femurs which are stacked onto the walls with many being placed in different shapes and patterns. As from the French revolution, the deceased were buried directly into the catacombs while holding some historically famous names such as Jean-Paul Marat and Maximilien de Robespierre. Today the catacombs are open for viewing in small group tours. The Museum of Broken Relationships is dedicated to failed relationships and houses left behind objects from failed love donated by people. Each item is then put on display and paired with a brief description. This quirky idea was the brainchild of film producer Olinka Vištica and sculptor Dražen Grubišić, who started asking their friends and family to donate items from broken relationships. The collection was first seen by the public in 2006 as part of the 41st Zagreb Salon in Glyptotheque Zagreb, and toured the world visiting countries all across Europe, Africa and the United States. In the four years up until 2010, the collection was viewed by more than 200,000 people and picked up many more donated objects along the way. 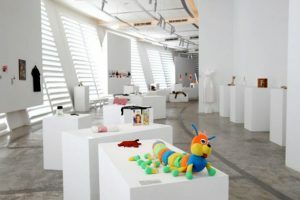 After wanting to find a permanent place for these objects to be shown, the museum finally opened in October 2010 in Zagreb, Croatia making it the city’s first privately owned museum. 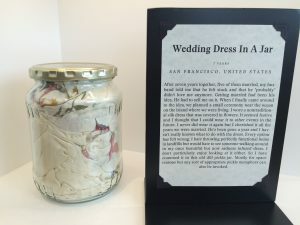 In 2011, the museum won the Kenneth Hudson Award, provided by the European Museum Forum, for its display of unusual and controversial items. It’s a quirky yet interesting place to visit. Kotor is a small city based on the coast of Montenegro which is home to much tradition, history and culture. The city was built between the 12th and 14th centuries and holds many medieval architecture and historic momentums. Though this city is quite small, the value it holds is the reason it is slowly becoming more popular tourist destination. From its scenic views, glorious mountains, ancient ruins and city layout, it is a small spot of paradise that shouldn’t be missed. The Père-Lachaise cemetery was established in 1804 (after burials were becoming more common again following the burials in the catacombs) and greatly struggled with the amount of burials due to many people believing the area was undesirable and too far away from the city centre to travel to. To increase the cemetery’s burial population, administrators provided a solution: transfer famous graves onto the grounds. Over time, the graves of Marcel Proust, Jim Morrison and many more provided the cemetery with the exposure it needed to expand burial grounds and was soon to become a tourist destination, with the most famous grave being Irish author, play writer and poet, Oscar Wilde. 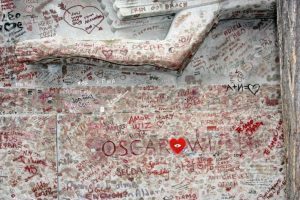 After Wilde’s tomb was transferred in the early 1900s, for years many people would visit the grave and leave behind love letters in memory of the great author, however that all changed in 1990s when someone decided to leave a lipstick kiss mark on the grave. Since then, to leave a kiss on Wild’s grave has been glorified as a sign of luck as over the years thousands of people have visited the tomb to participate, turning it into an even bigger tourist attraction. Not long after this trend, Wilde’s grandson made aware that this was becoming a “serious problem” as the grease from the lipstick began to sink into the stone of the tomb causing it to crack. However, not enough could be said to keep people away or from leaving their mark on the tomb. In 2011, a glass barrier was placed around the tomb essentially making it ‘kiss-proof’, however people have still managed to find a way over it to place their kiss of luck onto the famous tomb. The Camino De Santiago is a famous European walk dating back to medieval times. 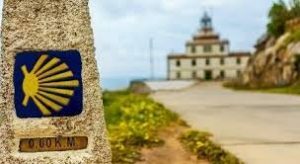 There is no particular starting point for this walk, as it was created during a time where millions of people would make their way to Santiago De Compostela from different points in Europe, meaning the choice of paths is endless. However, the most popular track is the ‘Camino Frances’ (The French way), beginning at St. Jean Pied-du-Port in France and ending 60 miles south of the coast in Spain. This path is 500 miles long and can take up to one month to complete. People normally walk about 30km each day however, due to the average daily summer heat of 40 degrees, the daily distance may vary. This route passes through places such as Pamplona, Burgos, Leon and many small towns and villages. The walk has become popular as the final destination is believed to be where the remains of the Apostle St James, Patron Saint of Spain, is buried, and this walk was the path he took to get to his final resting place. Along the walk there are many symbols of shells, either paved onto the ground or carved into things. Essentially the shells are meant to lead walkers to their destination and keep them on the right path. One great location on this route is the Bodegas Irache wine wall, located in Navarre, Spain, where an old winery has a wine fountain in one of its ancient walls where people traveling on the way of St James can stop and enjoy the free tasting. Monteora, Greece, is home to one of the world’s largest and most steeply built Eastern Orthodox monasteries build directly onto natural pillars. Before building these monasteries, there is evidence the surrounding caves were inhabited by humans as far back as 50,000 years ago. The first group of monks to live in this area were a group or hermit monks in the 9th century, where they lived high up in rock towers some reaching levels of 1800 ft. With the combination of height and cliff walls this ensured visitors were kept out and that they could live peacefully. Today, some of these caves are still visible, one of them being ’Prisoners cave’ which is believed to be the place where many prisoners were sent if they were bad or wanted to die due to the amount of bones that are still found around this cave. The exact dates these monasteries were built are unknown, it is believed they date back to the 14th century when the increasing number of Turkish residents migrated to Europe and the monks wanted to find a better place to hide. Back then, gaining access to these monasteries was quite difficult but today access is a lot simpler, with steps carved into the rocks during the 1920s. Today only six of the original 24 monasteries are still functioning (five male and one female) each holding less than 10 people. 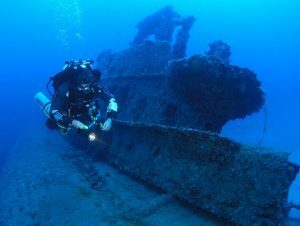 Malta is home to some of the oldest shipwrecks in the world, many of which can be dived under and explore. One of these ships is the ‘HMS Stubborn’ which was used by the Royal Navy as target practice. 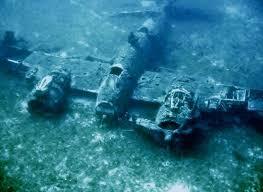 In 1945, this ship was hit by a depth charge and lost its tail fin sinking along with its 44 members on board. Today this ship lies at a depth of 56m and is still in great condition for exploring. Another great dive is the ‘Blenheim Bomber’ which is a World War II air craft which, in 1941 was sent out on a bombing raid, however was shot down only after a few minutes. The pilot made a clean escape and jumped out before this aircraft crashed into the ocean where it still remains at a depth of 42m. There are numerous amounts of these ships all along the coast in Malta with many companies willing to take you under to have a look. Forget about the Coliseum in Rome because France has its very own! 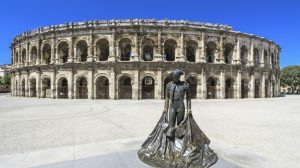 Built around 70AD (roughly 100 years younger than the one in Rome) by the Romans during their settlement in Nimes, this amphitheatre was built for entertainment. From gladiator matches with animal hunts including lions and tigers to executions where those convicted were sentenced to death by being thrown into the arena with a vicious animals. This arena could seat up to 24,000 people with members of the public having to sit according to their social status to watch any games held. 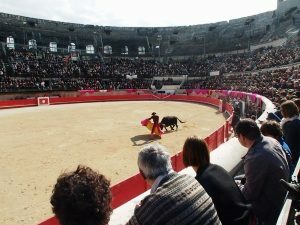 Today this arena is used for bull fighting and concerts. Fun fact: when the band ‘Daft Punk’ played there, their music was that loud it cracked part of the amphitheatre. Next articleAre you being targeted by the Police?